Our tour will take you around the biggest firefly colony in Malaysia. 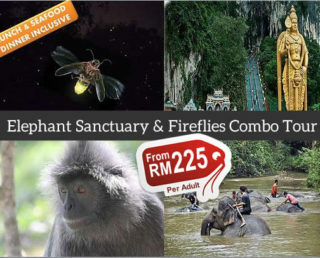 You will be visiting the small town of Kuala Selangor which is the site of the firefly sanctuary. A visit to the Kuala Selangor Firefly Sanctuary is not the typical route tourists take which is why you can still see the site has maintained its small village atmosphere and its traditional look. After the firefly tour, tourists can also enjoy the delicious seafood being served in the on-site restaurant. In this tour, you will also get to visit the Bukit Melawati peak. It was once a site of a mighty ancient Malaysian fortress. The tour will also pass by the well-known Altingburg LightHouse. It’s an old lighthouse which gives you a great view of the Malacca Straits. It is also home to the famous Malaysian silver leaf monkeys. These monkeys are born with golden hair but as they grow older the hair gradually turns black. The Kuala Selangor Fireflies Park is full of Berembang Trees which is home to thousands of fireflies. 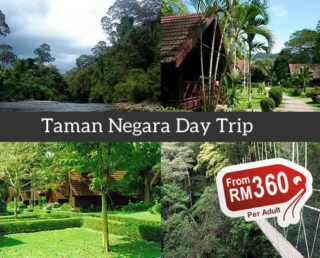 The natural environment is good for those who want to relax, be away from the busy Kuala Lumpur city. However, the highlight of the park is at night when the fireflies light up at night with their bioluminescence characteristics. This place has enough electric boats to get tourists to explore the beautiful light show at the river at night. Dinner is served inside the in-park restaurants. Guests can also go to the nearby chalets if they wish to spend the night at the park. Our tour will last for an estimated five and a half hours where tourists get to ride the boat up the river to see magical fireflies. They will go to Bukit Melawati where they can interact with the Silverleaf Monkey. A Malay Village pass by is also scheduled as a part of the tour. The fully air-conditioned vehicles will be manned by your own personal driver/tour guide with pick-up times from 4:15 pm to 4:30 pm. Inclusive in the tour is a nice seafood dinner and the boat ride along the river in Kuala Selangor. A complete set of magical activities are lined up for tourists when they avail of our tour. We have the enchanting night boat ride where they get to see the magnificent light show provided by fireflies. A delicious dinner also awaits after the tour. It also includes a visit to the Malay Village and Bukit Melawati. This boat tour will let you see the fireflies hovering on the river in Kuala Selangor. It takes about half an hour to complete the tour while you’re in the middle of the tour the boat stops at a station where you can observe the light show. Before the firefly boat tour, you will have dinner at one of the many seafood restaurants inside the park. These restaurants are known for its delicious seafood dishes which is located near the waterfront. Your guide will take you to the best restaurant of that row. An underappreciated part of the tour is the Malay village that has been maintained along the river. There continue to be natives residing in the area where traditional houses and their culture are preserved. It is a good educational experience for both locals and foreigners taking our tour. Your tour guide will also accompany you to the Bukit Melawati peak to enjoy the scenery. This is a historical place because it is where the old Malaysian Fortress stood. Tourists will learn more about Malaysian history during this tour. While you’re in Bukit Melawati peak, you will have an opportunity to interact with the Silverleaf Monkey which is also a native specie in the area. These are unique apes because the younger silverleaf monkeys have golden hair. You get to feed and interact with them during scheduled feeding sessions. A memorable tour awaits you if your book with us. 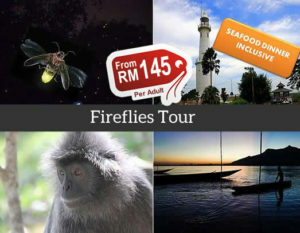 You not only get to ride the well-known firefly boat tour where you see a magical light show made from fireflies, but you also get to see other sceneries such as Bukit Melawati and experience the culture of the early Malays through the Malay Village. Book your tour with MyTravelLane online to avail of the low rates 125 RM for kids and as low as 148 per adult. These are the lowest prices you can find, and you don’t even have to worry about the itinerary and knowing where you’re going. You just hop on our vehicle and take you there. All you need to do is book today! Fast booking with them. Friendly guide and driver, also! My wife and I really enjoyed our tour of the Kuala Selangor Selangor Sanctuary. The private boat ride was so romantic, and the light show from thousands of fireflies made it even more amazing. We plan to do more tours like this in the future thanks to mytravellane. Our group enjoyed the whole boat ride along the river. Getting to see the Malay Village, interacting with the Silverleaf Monkey, and capping off with the beautiful fireflies at night made it one of the best tours I experienced. The tour was very nicely arranged. I loved the boat ride the most at the fireflies area, which was serene and relaxing. The packaged dinner in a halal seafood Chinese restaurant was value for money. I’d do business with Travel My Lane again & recommend it highly. The tour guide came to hotel on-time, and took us to a park with full of cute monkeys. Fireflies looked amazing and unforgettable. Nice to see many fireflies. Seafood dinner is fine. Our guide was very friendly and eager to show us much more than what was promised. Dinner was so-so but we had a great time overall. Well executed, the monkey feeding was an great bonus. Dinner was decent too and good portion of food. Our driver and tour guide, was very nice and give us a lot of tips for the tour. We were very impressed by the local tour guide. good experience, well plan, must join. We have good experience in this short tour. The tourist is very friendly and nice. The dinner, seafood is very delicious, The sceneof firefly over river is very beautiful. Great driver, great food, good fun feeding the sweet monkeys and the fireflies were just sooo beautiful and special. The driver was very helpful! Fireflies Night Cruise was an amazing! Amazing seeing the fireflies twinkle the Christmas lights. But that wasn’t the highlight of the trip, it was the monkeys that started climbing me to get the food. The trip is not bad, but was bitten by mosquitoes, want to go friends remember to do strong anti-mosquito measures, gown trousers, mosquito bites I have mosquito bites. Unavoidable. It was fantastic. Fireflies were like Christmas trees, Monkey Hill monkeys were so cute and lovely. The meal was also good, and the guide was very friendly. The fireflies are amazing. What a fun and memorable trip! The Driver is nice and friendly, thank you! Fireflies are very beautiful, feeding monkey is nice.B est service and accommodating drivers. Amazing Fireflies! Overall, the trip was a very great experience. The meal was tasty. It should be noted that drink (other than tea) was not included and had to be paid separately, the price was reasonable though. Our driver, provided good services. The fireflies are so amazing. Great creation from God! Marvelous trip! It’s worth that it everyone should arrange into their own schedule, and enjoy the surprise which the sparking fireflies bring. It was a great experience. Nice place. Had a great time! Excellent tour! Great insight provided. Good English, punctual and professional. Extremely organised, highly recommended. The price is cheaper compare to other website, everything is Great! Definitely Will come again ! Breath-taking!!! 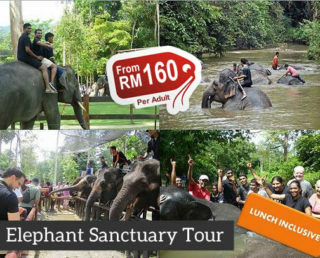 The best experience in KL!! !